A GAMER'S WIFE: Happy Year of the Dragon! During a Chinese New Year party with friends, I found out that apparently Chinese parents will deliberately wait till the year of the dragon to have kids because it's considered the luckiest of all the zodiac animals. Wow, I guess that means we're going to have a little dragon baby on our hands... maybe I should make a little dragon plushie in preparation? 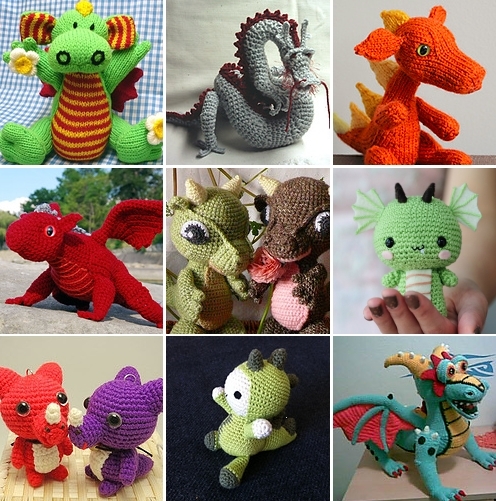 Unlike my search for geeky baby outfits, I found tons of amigurumi patterns on Ravelry to make. They're all so cute! I may have to make a trio of them, one zodiac animal for each family member. :) Of course, that would be after I finish the doggy black dress and the Link costume and... yeah.